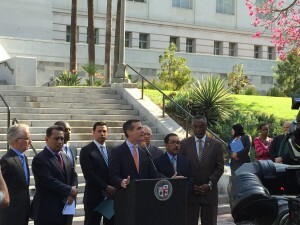 The good news is that Los Angeles has declared a State of Emergency on homelessness. This will enable the city to focus $100 million in resources towards housing those on the streets and preventing others from falling into homelessness. The bad news is that there has been a homelessness crisis for years. In fact, for much of that time, the city was part of the problem. At the beginning of the summer, City Council passed an ordinance which allowed LAPD or other city workers to confiscate (“steal”) the private property of people living on the streets—including their ID and medicines. While the summer in the poverty and homelessness committee of City Council has been spent in an attempt to gently walk back parts of the ordinance (which our mayor didn’t sign, but did not veto, and therefore it became law), the basic idea that being homeless is a criminal activity deserving of punishment still stands . It is therefore a positive development that the same Council members from the Homelessness and Poverty Committee, were those who were, with the mayor, announcing a state of emergency. One, however, remains skeptical. In the last budget, approximately $100 million was allocated for homelessness. However, out of that $81 million was for LAPD while only $13 million was for homeless services. Criminalizing and jailing homeless folks will not solve the problem. This morning, the mayor again promised $100 million for fighting homelessness, and again said that $13 million would be put towards housing. In Los Angeles’ insane housing market, when there is not enough existing housing stock to house all those who need housing, $13 million is woefully inadequate. Luckily, along with members of the business community (a lot of the same folks who opposed the $15 an hour wage) there was a strong showing of housing and homeless advocates at the press conference this morning, to remind the mayor and the council that we will be keeping a wary eye on where the money ends up, and whether the community has serious input into those decisions. On this day before Yom Kippur, I felt the spirit of Isaiah standing with us, with his stern and steely gaze taking in the press conference, but also seeing the folks who had spent the night sleeping on the grass of the South Lawn, and also the five to six thosuand who were living in tents and in the open five or six blocks south on skid row. It is appropriate to go into the fast of Yom Kippur bothered and unsettled by this. To all who are fasting, may it be meaningful, may it propel you on to do the work of justice, may you and yours merit a good and healthy year. This entry was posted in economic justice, homelessness, Yom Kippur and tagged homelessness, Yom Kippur by admin. Bookmark the permalink.